CLEAN CAR FAX! 1-OWNER! 0-ACCIDENTS! 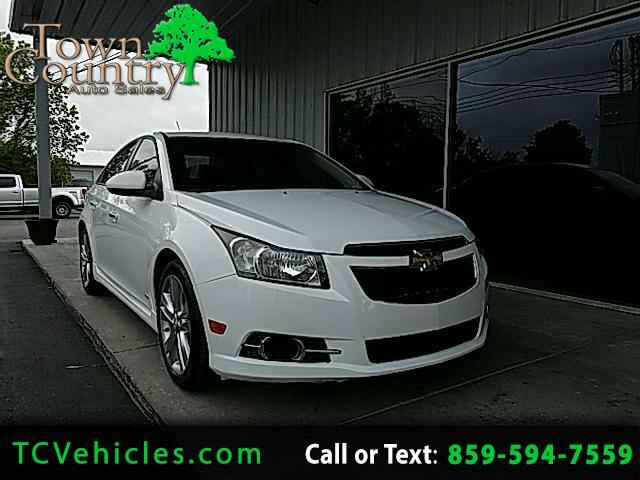 We have a super sharp 2012 Chevrolet Cruze LTZ with alloy wheels ready for its new home. 107K Miles with a 2 Mo. 2,000 mile warranty included with purchase. Our Cruze has a beautiful white exterior, with an all tan leather interior, with options including auto lights, fog lights, cruise control, steering wheel mounted controls, key-less entry, with remote start, On-Star & BT hands free calling, auto climate control, with heated seats, power windows, locks, mirrors, and seats. This is a great gas saver that has plenty to offer, So give one of our sales professionals a call today for more info and to learn more about our financing options. We know there are many different credit situations that arise and we have plenty of banks that are offering to help you with your finance options so you can drive away today. Better hurry!! This one won't last long. We have been Proudly serving Central Ky. for over 17 years and have over 350 Vehicles in inventory. So come and join our family! Call us at 859-594-7559 today to schedule your test drive. Message: Thought you might be interested in this 2012 Chevrolet Cruze. PRE-OWNED *** 2 Month / 2,000 Mile Warranty Included with the Purchase of this Vehicle. At Town & Country Auto Sales, our goal is to give you the best quality vehicles at the best prices. To give you competitive prices on our pre-owned vehicles, we here at Town & Country Auto Sales use something called "Market Based Pricing." This means that our prices are not based on book value, but rather the current market's supply and demand. This is how we make sure that our deals are the best deals. Our prices, in addition to our convenient location, our outstanding reputation, the level of reconditioning we put into our cars, and our ability to provide you with the best possible price, make us an attractive choice for your next pre-owned vehicle. That's how market base pricing works...you get the best value around! In today's world, you can look at cars anywhere you like with a click on the button. Use the market to your advantage and make sure you get the best price. At Town & Country Auto Sales, we strive to make it difficult to beat our prices. This is why we put a 2 Month 2,000 mile Warranty on all eligible pre-owned vehicles. So Don't pay hundreds or even thousands of dollars more at other dealerships - get the right price from the start only at TOWN & COUNTRY AUTO SALES. If you're like most of our customers, we know you'll appreciate our upfront and honest sales strategy that we employ with our Market Based Pricing. Sales Tax, Title, License Fee, Registration Fee, Dealer Documentary Fee, Finance Charges, are additional to the advertised price. We make every effort to provide you with the most accurate, up-to-date information for each vehicle listed for sale here on this site. However, although every reasonable effort has been made to ensure the accuracy of this information, absolute accuracy cannot be guaranteed. We cannot be responsible for typographical errors, including data transmission, display or software errors, that may appear on this site. For the most up-to-date and accurate information regarding this vehicle, please verify pricing, equipment, mileage and availability directly with us by using the information in the "Contact Us" section of our website. This site, and all information and materials appearing on it, are presented to the user "as is" without warranty of any kind, either express or implied. All vehicles are subject to prior sale. **IF YOU ARE OUT OF THE AREA AND WOULD LIKE A BETTER LOOK AT ANY VEHICLE, PLEASE CONTACT US AND LET ONE OF OUR SALES PROFESSIONALS EMAIL YOU A VIDEO TEST DRIVE!